RadarScreen looks very much like a spreadsheet and you may wonder, how you could sum or perform some other spreadsheet like operation on a column of numbers or booleans? Despite of its appearance, each row in Radarscreen can best be thought of as if it were a separate chart, albeit with the plots expressed as the latest value rather than a graphical representation. There are, however, ways of emulating spreadsheet like behavior and this is what this tutorial explores. Tutorial 132 uses two different ways of achieving this. In the first the GlobalVariable.DLL is utilized. Even though this DLL was introduced a few years ago, it still does a good job sharing real time date between charts or rows in RadarScreen. In this program we are specifically sharing information in the plot 2 column with all the other rows. The problem comes when the individual rows are waiting for a price tick to occur before updating. In other words, they have the correct information available to them but don’t do anything with it until the program next runs (on the next tick). This can result in the updates being slow and seemingly uncoordinated. You can see this occurring in image and the videos below. The GlobalVariable.DLL version is named _Tutorial132 (shown on the left). The second approach is to use the GlobalDictionary which is now built into TradeStation as standard. This also does a great job in sharing the plot 2 status between all the rows but it also has the major advantage of having an event available that fires when an item stored in the dictionary is updated. For example, if row 1 was updated but price did not tick in any of the other rows, the event would still be fired for ALL the rows which can update Plot3 if necessary. Tutorial 132 applied to several symbols. The first program is applied on the left. Note that the updates don’t appear to be happening synchronously. Both programs store data in their respective dictionaries using the number of the row to which the program is applied. In the case of the Global Dictionary, this is converted to a string. To use the first example program you will need to install GlobalVriable.DLL. This is available in the TradeStation form together with a user manual, example programs and related functions. Be sure to download the latest version and to follow the installation instructions. 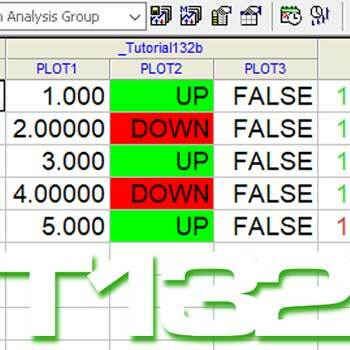 The tutorial 132 indicators (_Tutorial132 and _Tutorial132b) are available for download for $9.95 by clicking the following link. The programs works with TradeStation.